Just as I was drafting this editorial, the total amount of dogs that took part in these events attained 794,817; as a matter of course, this is not a final figure, given that the results of the shows have not all been received or dealt with yet. To date, the dogs that got the CACIB amount to 88,651. Besides, the FCI Office has confirmed 7,431 CIB (Champion International de Beauté - International Champion of Beauty) titles and 1,310 CIE (Champion International d’Expositions – International Show Champion) titles. To these figures may be added 208 Work Champion titles (agility, obedience, hunting, utility) plus 36 FCI-Centenary Show Champion titles. Winning the latter, which was specially created for the purpose of celebrating the 100th anniversary of the FCI, required 2 CACIB or 2 RCACIB plus 1 CACIB won on the occasion of the FCI Centenary shows (Dortmund, May 2011, Paris, July 2011 and Leeuwarden, September 2011). Altogether, no less than 8,990 titles were confirmed, compared to 7,776 in 2010. An amazing total of 2,013 working competitions (hunting dogs, herding dogs, Sighthounds races, agility and obedience) was organised, which demonstrates a relatively stable trend: in 2010, the registered competition applications amounted to 2,138. 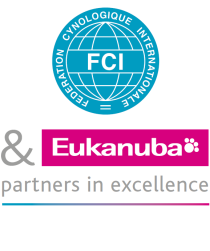 On the other hand, another trend shows a dramatic decrease – a presumably worrying fact: the count of registered FCI kennel names has fallen to 19,694, compared to 23,038 in 2010. Is the number of breeders decreasing? Has the kennel name granting system changed in some countries? Unfortunately, these are questions without answers. Let’s finish with another very interesting and heartening figure, namely the amount of visits on the FCI websites, http://www.fci.be and http://www.dogdotcom.be, which hosts our newsletter. The fci.be website has indeed been recording a substantial progression, from 744,000 visits for the year 2009 to 1,042,000 visits in 2010 and 1,095,000 visits in 2011, that is a 30% increase or so in 2 years. In addition, the newsletter website, dogdotcom.be, also shows a positive rising curve: in 2011 – its launching year – it was visited 33,455 times, and the number of visits reached as much as 4,360 in January 2012. This is an unquestionable proof of fact: the Internet has definitely turned into a communication tool that cannot be ignored.